Tradition changes as it flows through time, picking up new elements and adapting, but it also retains its core identity, the late Evi Voutsina wrote. About the Author: The late Evi Voutsina (1950-2013) was an acclaimed chef and food writer and a leading figure in the documentation and preservation of traditional Greek cuisine. This article was first published in Kathimerini newspaper. 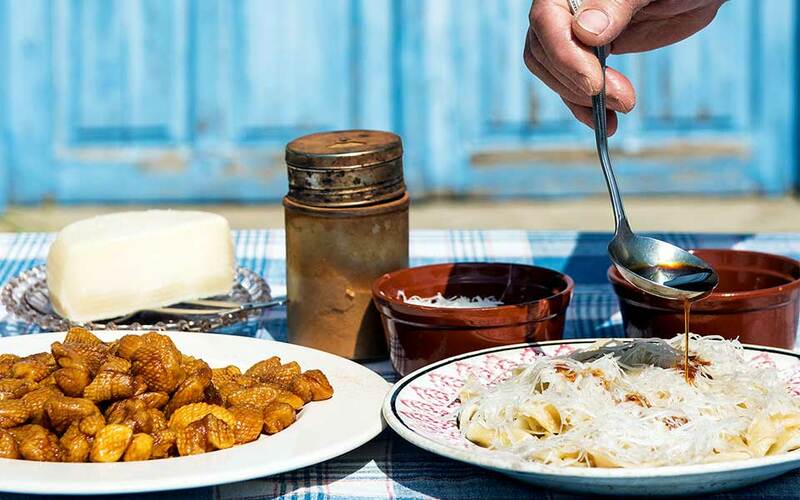 When we talk about Greek food, we mean the country’s traditional cuisine, even though we tend to overlook the word “traditional,” which requires its own lengthy explanation. 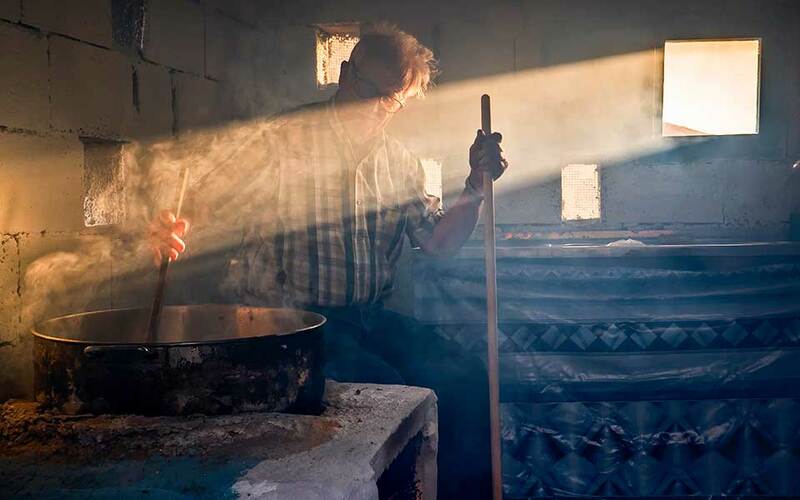 A thankfully dwindling number of people still associate that word with the bygone era of looms, washboards and oil lamps, and with the smell of fresh dung. Why don’t we let it bring to mind the flavors and aromas of oregano, honey, good wine, bergamot, bitter-sweet grape syrup and myriad wild greens instead? Many countries treat the notion of tradition in a similarly dismissive manner, but a further complication in Greece is that we have not defined the term “tradition” in an indisputable way. Fundamental questions remain unanswered, such as: How far back does our tradition stretch? Are we related to the ancient Greeks? Were we around in Byzantine times? What was our role during Ottoman rule? Did we have a culture then? And what happened after the establishment of the Greek state to make us forget our wild greens pies or our meat casseroles with quince, almonds and prunes? What separates us from our grandmothers who, in the blink of an eye, could roll out a hundred paper-thin sheets of pastry and throw together a tray of baklava? I can’t open every chest of memories to see which of them contain treasures and which hold only ghosts, so let me pick up the thread of the story as close as possible to the present. Contrary to what many believe, tradition is a dynamic force. It evolves and it assimilates contemporary elements, sometimes slowly and sometimes quickly. I remember Dimitris Papiris, an elderly man in the western seaside town of Preveza, telling me how he served a meze of octopus with quince at the ouzeri he had run since 1950. Noting my obvious skepticism, he politely reminded me how Greek cooking had changed, largely thanks to Ioannis Kapodistrias, the country’s first head of state after liberation. I was too stunned to answer him. Potatoes, tomatoes, peppers and corn are all things that came to Greece from the New World and were quickly assimilated into our cuisine, because they were hearty, easy-to-grow foods. They were soon in every kitchen, prepared using existing Greek cooking techniques and combined with ingredients that had always been around. A similar pattern is evident in other countries. Like all traditional cuisines, however, the cooking of Greece has certain principles that never change. These are often related to climatic conditions and matters of economy. 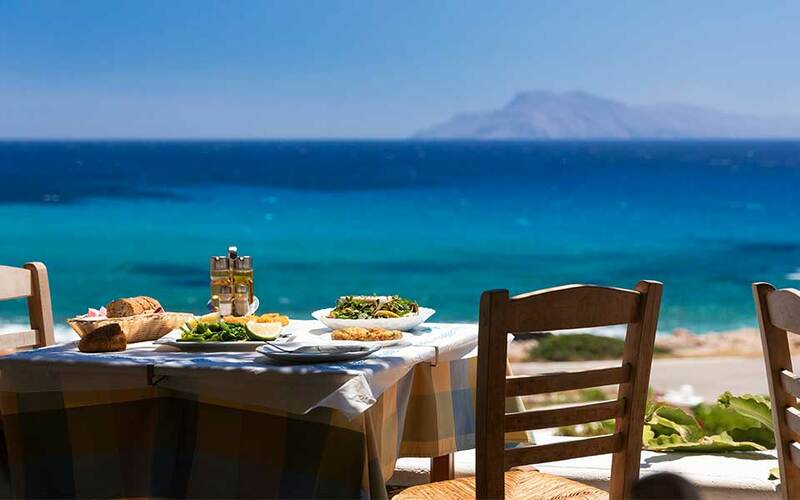 Greek cuisine, for example, respects seasonality and uses products when they are at their finest. As much as we may love stuffed cabbage leaves, for example, we won’t make them in April or May, when the spring garden brings us fresh peas, artichokes, heady fennel, asparagus and broad beans. Authentic Greek cuisine is always about striking a balance. The sweetness of peas, for example, is offset by a bit of sour plum. Readers may argue that you cannot always find fresh plums, but they forget that the market is shaped by demand. If enough people ask for a thing, it will eventually appear. Look at petimezi (grape syrup), which was almost forgotten some 15 years ago but now can be purchased in every supermarket and grocery store. Tradition changes as it flows through time, picking up new elements and adapting, but it also retains its core identity. And the message that modern man must heed is that, ultimately, it’s all about management. How many people, for example, know that you can make a wonderful salad from the peppery young leaves of the tomato plant, the broad bean or the onion? “I’m waiting for the beans to ripen but, until they do, I can enjoy the sweetness of their leaves,” I recall a woman from Thrace telling me. This makes sense. Most people nowadays who live in cities and spend hours sitting don’t use as much olive oil with their peas or their artichokes as their grandparents once did. We adapt to the times, and this is precisely the point of tradition: changing to meet new needs but keeping the core identity, the principles of Greek food, intact.